Ideal as a dual-purpose backcountry/all-mountain setup, the ATOMIC Backland FR 102 W Skis feature a lightweight wood core combined with a carbon backbone and solid stepdown sidewalls that put a priority on soft-snow performance. Ride inbounds pow in the morning and enjoy a tour out the backcountry gate in the afternoon with ease thanks to the ATOMIC Backland FR 102 W Skis! Powder Rocker 20 / 70 / 10. Tip and tail rocker with camber underfoot creates a supremely versatile platform that excels in powder, crud, and everything in between. Made from poplar wood, this core optimizes the skis weight without sacrificing any shock absorption or stability. An ultra-lightweight carbon insert that runs the length of the ski like a stabilizing backbone. This provides exceptional agility and edge hold with no extra weight. Lightweight and highly resistant (made from 50% rapeseed oil). Step Down Sidewall 2.0. Features a symmetrical step on each end that's stable, light, and durable. 7000-series sintered bases that are fast on any snow, can stand up to anything, and are easy to maintain. Hardened steel for durability and perfect edge grip. We recommend a brake width equal to or at most 15 mm wider than the ski waist width. 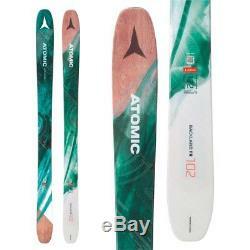 The item "ATOMIC BACKLAND 102 POWDER/ALL MOUNTAIN WOMEN'S SKIS (VARIOUS SIZES)" is in sale since Saturday, January 5, 2019. This item is in the category "Sporting Goods\Winter Sports\Downhill Skiing\Skis". The seller is "slopestyleskishop" and is located in Breckenridge, Colorado. This item can be shipped to United States.